While there are plenty of extra-charge dining options onboard, passengers have enough variety and quality of free food. Traditionalists who prefer waiter service can head to the ship's three main dining rooms: Symphony, Allegro and Concerto. Those who like a casual buffet can go to the World Fresh Marketplace. For lunch by the pool, check out the free noodle soups, lobster (extra charge) and free burgers and hot dogs. International Cafe (Deck 5): The popular International Cafe in the Piazza is open 24 hours. Specialty coffees and premium teas are priced a la carte, but the pastries, paninis and salads are free. The selection changes through the day, starting with light morning snacks such as an English muffin with egg, almond croissants and banana bread, which are handy to grab instead of a big breakfast. A 15-drink punch card can be purchased to save money, and unused punches carry over to your next cruise. Allegro Dining Room (Deck 6): This traditional dining room is open for breakfast, lunch and dinner, with waiters providing table service. Breakfast is typically served 7 a.m. to 9 a.m. and lunch is 11:30 a.m. to 1 p.m. On sea days there are set dinner times: a first seating at 5:30 p.m. and a second seating at 7:45 p.m. On port days it is open sitting from 6 p.m. to 10 p.m. Menus offer an entree, a soup or salad course, main meal and dessert. Dishes can include meat, seafood, pasta and vegetarian options, regional cuisine, and low-fat, sugar-free and gluten-free items. Symphony Dining Room (Deck 5): Also, a traditional dining room with 5:30 p.m. and 7:45 p.m. seatings. The menu in Symphony is the same as in Allegro and Concerto. It was closed on our port day. Concerto Dining Room (Deck 6): Serving dinner only, Concerto is open sitting on port days between 5:30 p.m. and 10 p.m. and has two seatings on sea days at 5:30 p.m. and 7:45 p.m. The menu there is the same as in Allegro and Symphony. Alfredo's Pizzeria (Deck 6): Open for lunch and dinner, Alfredo's is always busy plating up free pizza, pasta and salads. Passengers can watch the chefs at work through a glass partition. Hot tip: i t's also open on embarkation day from noon (except during the muster drill) so is a good place for a quieter lunch while everyone else is cramming into the buffet. On other days, Alfredo's is open 11 a.m. to 11 p.m.
World Fresh Marketplace Buffet and Bistro (Deck 16): Known as the Horizon Court on other Princess ships, the buffet is massive and bountiful, with plenty of seating. Hand-washing basins as well as hand- sanitising sprays are located at entrances. This is the place to come if you want to dress casually, self-serve your food, re load your tray and get out of there. Waiters come to take your drink order, or there are several dispensers with a free selection of water, tea, coffee, iced tea and lemon cordial. Breakfast options include muesli, oatmeal, cereal, toast, scrambled and hard-boiled eggs, pastries, baked beans, grilled tomatoes, smoked salmon, cheese, fruit and yoghurt. Fried and poached eggs and omelettes can be made to order. There's also an Asian selection including congee, hot soups and dim sum. Lunch has carving stations of various meats, made-to-order sandwiches, soups, pasta and other hot dishes, Asian stir-fries, cold salads and salad bars to make your own. Dinner often had a theme such as French, Italian or English pub grub. Open from noon to 11 p.m. on embarkation day. On other days it is open for breakfast from 5:30 a.m. to 11:30 a.m., then lunch until 2 p.m., before closing until dinner at 5:30 p.m. to 11 p.m. The Bakery (Deck 16): An extension of buffet, this dessert counter is full of delectable items baked daily by the pastry chefs. The rotating selection is outstanding, with lots of cakes, pies, tarts and slices. Treat yourself. Swirls Ice Cream Bar (Deck 16): For cooling down by the pool, this handy kiosk on the Lido Deck has crew whipping up cones and cups of vanilla and chocolate; unlike some other Australian ships, Majestic Princess' soft-serve ice cream is free. At night, popcorn is handed out from here during Movies Under the Stars. Swirls is open 11 a.m. to 10 p.m. but sometimes closes for a few afternoon hours on port days. Chopsticks Noodle Bar (Deck 16): A first for Princess Cruises, this Asian take-away outlet is located poolside. Noodle soups are freshly made to order with your choice of fish balls, chicken, vegetables, tofu and wontons. Open from 11 a.m. to 1:30 p.m. and 5:30 p.m. to 11 p.m. Lobster Bar (Deck 16): Majestic Princess' poolside grill promises a decadent snacking option. Unfortunately, there was no lobster when we showed up, and on another day the venue was closed during the advertised opening hours. There is an extra charge for lobster when sailing in Australia and New Zealand. Open from 11 a.m. to 1:30 p.m. and 5:30 p.m. to 10 p.m.
Room Service: Available 24 hours a day, the morning sees breakfast items such as egg sandwiches, fruit and cereal; lunch and dinner include sandwiches, soups, salads, burgers, pizza and other hot meals. Chocolate cookies with milk is one of the cute Princess traditions on the late-night menu. There is no charge for room service (except $3 for pizza delivery). Spending a little extra money will bring rewards on Majestic Princess. The specialty restaurants are exceptional and the special-occasion dinners (which we didn't try) look well worth it based on the dazzling venues alone. 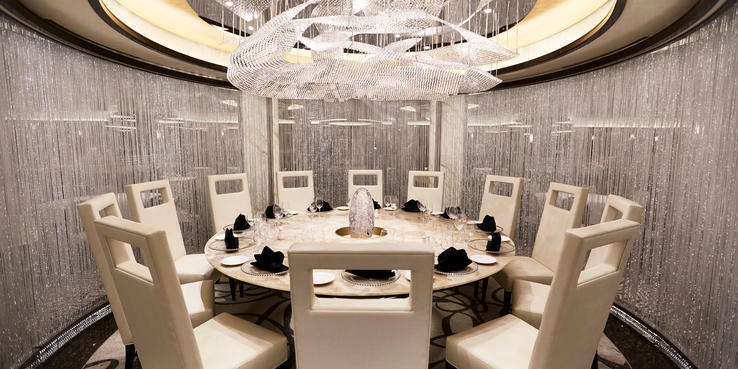 Harmony (Deck 5, midship); $29 per person: Sparkling with the touch of Michelin stars, Harmony is an elegant venue with golden decor and ocean views. The menu is designed by Taiwan-born chef Richard Chen, who was executive chef at Wynn Las Vegas' Wing Lei when it became the first Chinese restaurant in North America to be awarded a Michelin star. He's known for modern twists on duck and other traditional Cantonese dishes using Western ingredients and techniques. This is taken a step further onboard, as open flames are not allowed on cruise ships, so the chefs have to use induction cooktops. Chen says he now prefers the induction method, and his favourite meal is the wok-fried lobster with XO sauce (AU$12 surcharge). Sadly, they had run out of lobster when we dined so we didn't get to try it. The menu is the same for lunch and dinner; up to five courses can be selected. Starters include chilled abalone with green papaya salad, steamed pork spare ribs with squash and fermented black bean, or the Peking duck salad. Our pick is the delicious sampler of barbecue pork, beef tendon and jelly fish. Then comes a choice of two soups (herbal or roasted duck), followed by one of the main specialties such as sizzling chicken casserole, steamed sea bass or diced sausage with calamari, pickled daikon and chili. Diners can also choose fried rice, noodles or vegetables on the side. The three desserts are red bean creme brulee, green tea cheesecake and sake-marinated melon with passionfruit foam, coconut pineapple ice cream, mango sago soup and pistachio gelato. Open for lunch and dinner; reservations are required. Winemaker's Dinner (Symphony, Deck 5, and Concerto, Deck 6); $40 per person: Semi-private areas in the dining rooms are set aside for a special menu that pairs each course with a wine from one label. The set menu includes an amuse bouche, entree, soup, main and dessert, with wines topped up generously. As the winemakers vary each time, the dishes change for each dinner. Reservations can be made onboard at the guest services desk. Chef's Table Lumiere (Allegro, Deck 6 ); AU$115 per person: The Chef's Table Lumiere is perfectly named as the setting sees an oval table glowing under a wavy chandelier, a Murano glass centrepiece and crystal 'curtains of light' separating it from the rest of the dining room. The experience includes a behind-the-scenes tour of the main galley (kitchen), hosted by the maitre d' and executive chef, where the small group of diners drink Champagne and nibble on canapes. Then they move onto dinner of a specially created menu and wine pairing. Contact guest services to find out when the Chef's Table is available. Reservations are essential and limited to 12 people per night. La Mer (Deck 7, midship); AU$35 for dinner, AU$12 for lunch: Princess Cruises' first foray into French cuisine has ups and downs. Fortunately, the positives are the two most important aspects: food and service. The menu was created by Emmanuel Renaut, former head chef at Claridge's in London and current executive chef of Flocons de Sel in France, which has been awarded three Michelin stars over the past decade. Although it translates to 'the sea', La Mer impresses with its meat dishes, too. Dinner begins with two unusual welcomes: crust-less sardine sandwiches and crispy chips of ox tongue. Diners then choose from hors d'oeuvres such as escargot, pate in dough or ahi tuna tartare with 'parsley like a harlequin '. B ut we were most pleasantly surprised by the oeuf croquantcoulant, a crunchy-coated egg with creamy yolk, served on wild mushrooms and wine sauce. For the mains, our fellow diners raved about the duck (magret de canard) and pork (filet de porc roti), while our favourite dish (on the whole ship) was the red snapper and scallop mousseline with lemongrass lobster sauce. Finally, dessert is offered from a selection of floating island praline, chocolate and Chartreuse parfait, chocolate-mint tart or spice-roasted pineapple. La Mer's lunch menu consists of crepes, salad bowls, sandwiches and casseroles. The standout is probably the smoked sausage and braised pork belly in white bean stew. Wines, beers and French cocktails are sold separately. Our waiter was superbly professional and passionate, making excellent recommendations and explaining each dish in great detail. The downside of the venue is its open-plan layout and proximity to the Piazza while the entertainment is in full swing. We could barely hear our softly spoken server while the crowd below cheered and screamed and all kinds of strange noises blasted from the stage. The result was it feels like you're eating in a food court, which is not what you pay extra for, nor expect from a French bistro. Luckily the rest of the La Mer experience is distracting in a good way. Reservations essential. Crown Grill (Deck 7, aft); AU$29 per person: Princess Cruises' Crown Grill is the ultimate steakhouse at sea. Turn up hungry and early to grab a pre-dinner drink at the adjoining bar. Diners choose from appetizers, mains (including a wide variety of steaks and chops but also prawns and mussels) and shared sides (mashed potato and creamed spinach are our favourites). Surf n' turf incurs an AU$10 surcharge. Waiters describe the different cuts of steak and three gourmet salt choices -- Hawaiian Black, Smoked Applewood and Himalayan Mountain Pink. Save room for the dessert sampler. Open 5:30 to 9:30 p.m. Reservations essential.